Tesla Motors Buyout or Not: Can SolarCity Corp. Rebound After Its Terrible Start to 2016? After it missed estimates badly the past two quarters, SolarCity has many questions to answer for investors. A worker installing a rooftop solar system. Image source: Getty Images. SolarCity Corp. (NASDAQ:SCTY.DL) is mulling over an offer to be bought out by Tesla Motors (NASDAQ:TSLA), but given the market's negative reaction to the all-stock offer, it's very possible the deal won't go through. And if it doesn't, SolarCity investors should think about how the company will be on its own. The company's two most recent earnings reports were about as disappointing as you can get for investors. Fourth-quarter 2015 results showed the full year missing already-reduced earnings guidance, hitting just 870 MW of new installations for the year. First-quarter 2016 installations beat guidance, but bookings were weak, and full-year guidance was reduced from 1.25 GW to a range of 1 to 1.1 GW. The result has been a stock plunge that has to make even Elon Musk blanch. 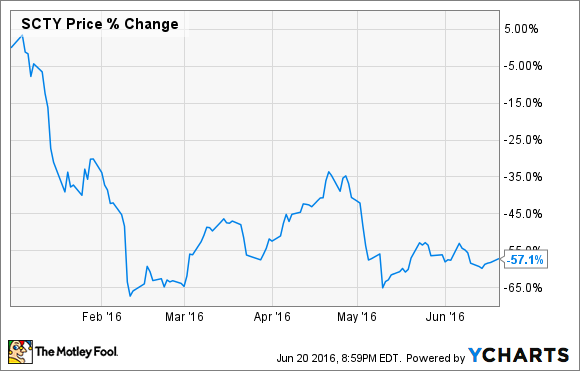 What can SolarCity do to turn the sentiment around? It will be an uphill battle, but here are a few options. One of the flaws SolarCity has had lately is the lack of a viable loan product. Both SolarCity and Vivint Solar built their business on leases and power purchase agreements (PPAs), where the company owns the solar power systems they install, and customers pay for them monthly. But customers are increasingly seeing there is greater value in owning their solar power systems, whether purchased with cash or via loans. CEO Lyndon Rive said that not having a loan product was a weakness for his company in the first quarter, so it recently began offering one. The loan product could help SolarCity expand its market at a time when an increasing number of customers want to go solar. The challenge will be pricing it in a way that both makes SolarCity money and saves customers money. The higher level of transparency of pricing a solar power system for purchase with a loan means SolarCity may have to compete more on price. And that may or may not be good for the company long term. Will the financing terms be attractive for residential solar? One piece of positive news that came out of the first quarter related to SolarCity's ability to finance projects. The company monetized $3.12 per watt deployed, and its long-term costs are trending well below that level (around $2.70 per watt). If SolarCity can sell chunks of the value in each solar lease or PPA contract -- tax benefits and future cash flows make up most of this value -- it can generate more cash than its costs each quarter. And that would be an enviable position for any company. The other big impact on SolarCity over the past six months has been state regulators ruling against the rooftop solar industry, which hasn't been usual throughout its history. Nevada pushed through a drastic change to its net metering rules that means solar customers now get the wholesale (instead of retail) rate for electricity they sell back to utilities. That essentially made rooftop solar uneconomical overnight, and SolarCity shut down its operations in the state immediately. Other utilities are trying to push through fixed charges that undermine the economics of rooftop solar. These have been more successful than direct net metering challenges, and are slowly squeezing SolarCity's potential market. If SolarCity, and the residential solar industry more broadly, can keep these challenges at bay, the market will be able to keep growing. If it can't, rooftop solar may stagnate. At this point, SolarCity has so many questions ahead that investors should approach the stock cautiously, even if you think Tesla will end up acquiring it. Management hasn't shown the ability to hit its own growth targets, and operating costs per installation have shot up as a result. If SolarCity can gain traction in loans and see the market for rooftop solar expand, the stock could get back to its former levels. But neither of those are guaranteed, and I'd like to see SolarCity prove its strategy is working before I jump into it as an investment.